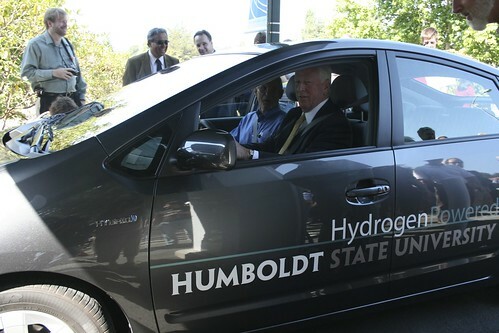 Humboldt State unveiled its hydrogen fueling station today with Rep. Mike Thompson here to help with the ribbon-cutting and talk about the role the Schatz Energy Research Center is playing in our renewable energy future. He's shown above driving HSU's hydrogen-powered car, which he'd just helped fill with fuel. Star of the show was Schatz lab director Peter Lehman (below), whose pioneering work was featured in a Journal story, " Peter and the Fuel Cell, " back in 2006. While this is certainly cutting edge stuff, there are limitations. The fueling station at Humboldt State is the northernmost outpost on what's deemed California's "hydrogen highway." The Toyota Prius hydro-car (converted at a cost of cost $45,000) will only go 100 miles on a 2.5 kilogram tank of hydro-fuel, and there is not another fueling station within its range. (A California Fuel Cell Partnership map shows the closest stations being in Davis and Oakland.) So, Humboldt's lone hydro-car is mostly for show: President Rollin Richmond will be among the drivers, and as a Schatz lab tech explained to Rep. Thompson, there are plans afoot to use the vehicle to take mail deliveries up to the Telonicher Marine Lab in Trinidad. The student team won the grand prize in the 2005 H2U international design competition sponsored by the US Department of Energy and ChevronTexaco, which led to acquisition of the Prius and building of the fueling station.